White House official says Trump’s senior advisor will meet regional partners and discuss how to support Israel-PA peace. 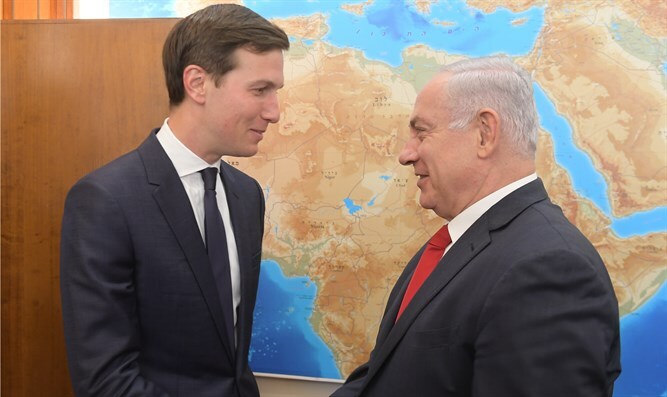 The upcoming visit to Israel by Jared Kushner, U.S. President Donald Trump’s son-in-law and senior advisor, will “continue discussions with regional partners about how best to support the peace effort,” a senior White House official told Arutz Sheva on Friday. “As President Donald J. Trump has clearly stated, he is personally committed to achieving a peace deal between Israel and the Palestinians that would help usher in an era of greater regional peace and prosperity. He believes that the restoration of calm and the stabilized situation in Jerusalem after the recent crisis on the Temple Mount/Haram al Sharif has created an opportunity to continue discussions and the pursuit of peace that began early in his administration,” the official said. “While the regional talks will play an important role, the President reaffirms that peace between Israelis and Palestinians can only be negotiated directly between the two parties and that the United States will continue working closely with the parties to make progress towards that goal,” stressed the White House official. “President Trump has previously noted that achieving an enduring Israeli-Palestinian peace agreement will be difficult but he remains optimistic that peace is possible. To enhance the chances for peace, all parties need to engage in creating an environment conducive to peace-making while affording the negotiators and facilitators the time and space they need to reach a deal,” he concluded. Kushner visited the region for one day in June to advance U.S. peace plans. He met with Prime Minister Binyamin Netanyahu for a meeting described by the American side as "positive and fruitful".